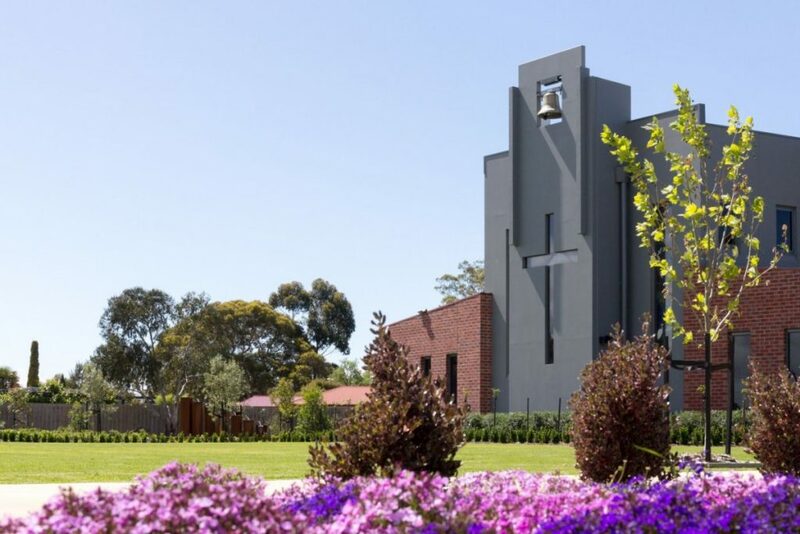 The Chapel of St. Mary of the Cross was a long held dream for the community of MacKillop College. Planning for the Chapel occurred over many years and after an extensive discernment process by the entire school community in 2015 several strong themes and ideas emerged about what was needed from our Chapel. The Chapel needed to be a place that invites peace and stillness. It must mark a retreat from the urgent, distracting busy-ness of modern life, to a place of quiet to allow that which is most important, to be heard. It needed to be an experiential place. A place where we feel connection with our past and present. 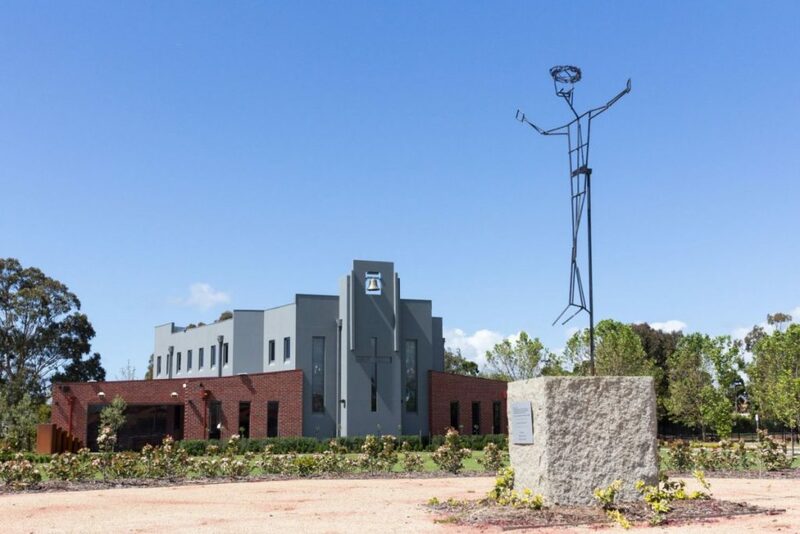 For MacKillop College the Chapel of Saint Mary of the Cross is more than a building. While the Chapel itself sits at the front of the property its presence permeates the College grounds. For us the Chapel precinct begins in the physical heart of the College at our ‘In the Beginning’ sculpture and this marks the beginning of our ‘Chapel Walk’. 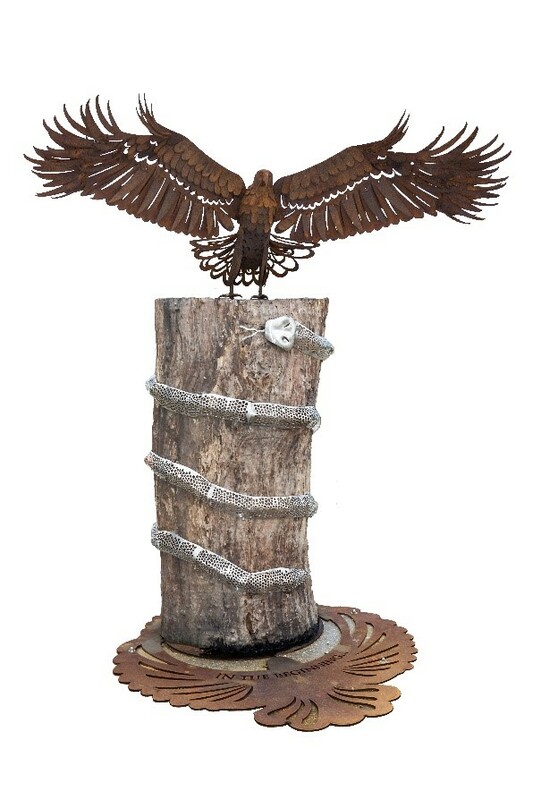 ‘In the Beginning’ is a scriptural reference from the first book of Genesis and our sculpture is an acknowledgement of both the ‘first peoples’ experience of creation along with our own as expressed in the Hebrew texts. From this point we follow a path, soon to have a timeline of the events of Mary MacKillop’s life placed along its route. This leads us to the College driveway were we come across ‘The Cross of Life’. This acts as a beacon to the community and highlights the Catholic nature of our College. We then move into the Mary MacKillop Memorial garden. The plants and trees in the garden have been sourced from the areas around Australia where Mary lived and worked. 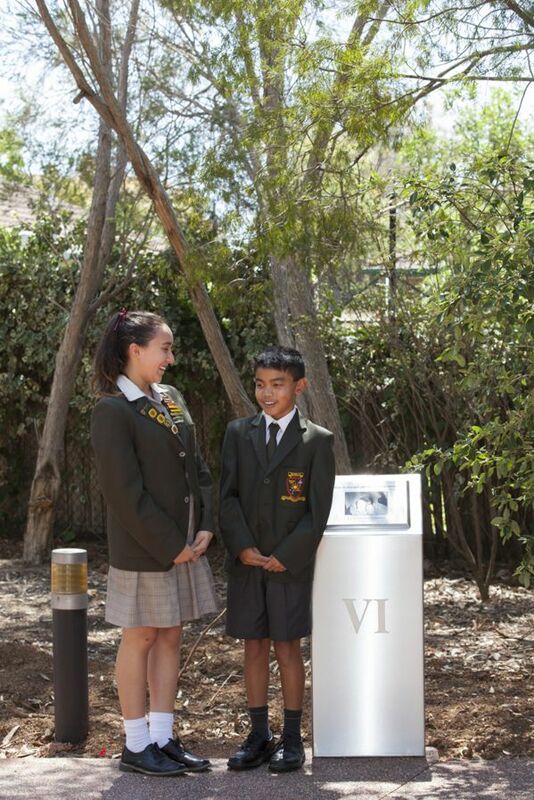 Contained within the Mary MacKillop Memorial garden are our Stations of the Cross. These Stations are based around those celebrated by Pope John Paul II on Good Friday 1991. They are presented here as an alternative to the traditional stations and as a way of reflecting more deeply on the Scriptural accounts of Christ’s passion. Each Station is represented with a scriptural quote, a contemporary photograph focusing on a modern day issue linked to the scripture and a quote from Mary MacKillop. After reflecting on each of the Stations of the Cross we arrive at our ‘dry creek bed’. 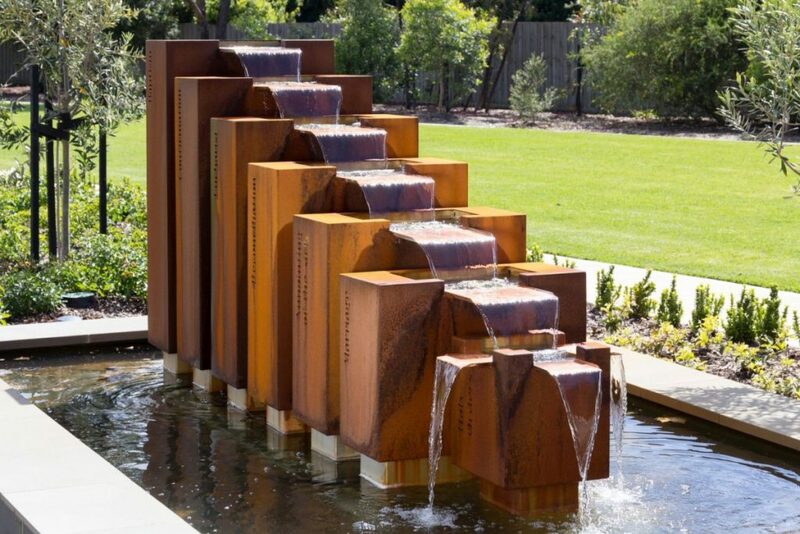 The ‘dry creek bed’ represents the Werribee River and the life that this brings to the Werribee area. The creek bed itself also marks the original boundary line of the College and sits where the front fence built in the 1990s once stood. 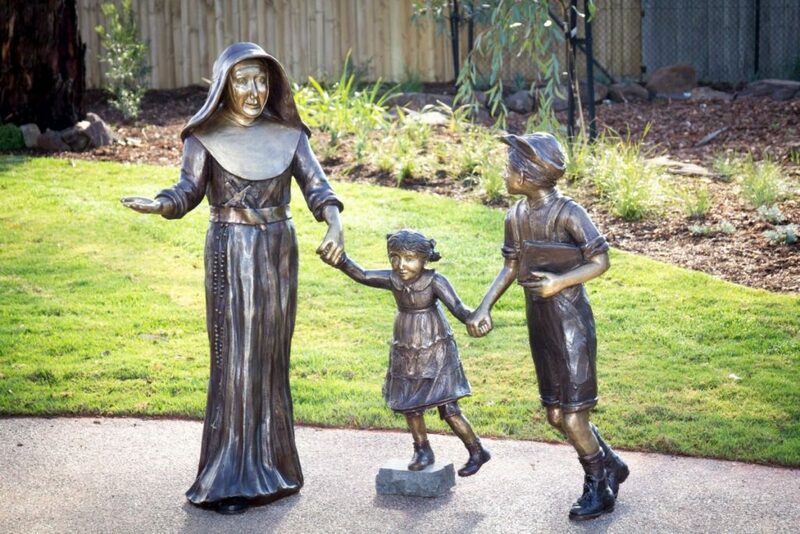 From here we are greeted by our statue entitled ‘Leap of Faith’ depicting Mary MacKillop and two young children. Mary’s warm smile and outstretched hand points us directly to the doors of the Chapel itself. The Chapel of Saint Mary of the Cross was designed in accordance with guidelines set out in Vatican II and as such is different in design to that of more traditional Churches and Chapels. Upon entering the Chapel is the Narthex. To the right is a place of remembrance and prayer to the Virgin Mary. A simple wooden statue and a ‘Madonna Lily’ mark this humble place of devotion. 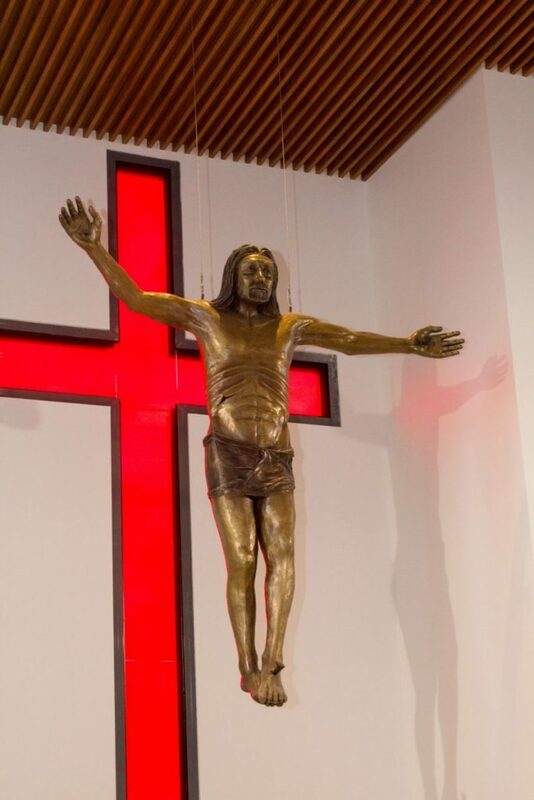 When entering the Chapel proper, our ‘Triumphant Jesus’ hangs majestically at the rear of the altar hovering gloriously in front of a glowing red stained glassed cross. The arrangement of altar furniture is also in line with the teachings of Vatican II, in which the priest is considered the ‘president’ of the liturgy and sits behind the altar. The tabernacle is placed in the Sacramental chapel to the side. This is a beautiful place of quiet contemplation and reflection. From the ‘reflection space’ our water feature ‘The Source’ can be seen, and in the distance the Labyrinth, ‘The way of the heart’ circles around a stark statue of the crucified Christ.